Deciding between performance and style is the unavoidable, brain-racking step during the otherwise exciting time of buying a laptop. The tighter the budget, the more difficult the struggle, as the luxury of finding a machine that performs well and has some style at a decent price isn't too common. 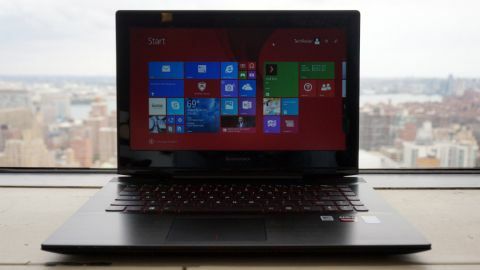 Starting at just $699 (about £426, AU$790), the Y40 boasts several brag-worthy features inherited from the 15.6-inch Lenovo Y50 and 17-inch Y70, also in the Y series. With sharp design, fantastic battery life and JBL audio that absolutely kills it, it's clear that the Y40 is a chip off the block, at least in some regards. The Y40 echoes the style of the Y50 throughout with its slick, yet modest clamshell design. The matte plastic lid (with crosshatch texture) and underside are a noticeable downgrade from the Y50's metal accents, but it's nothing to knock the Y40 for. The crosshatch design looks deluxe and also did a good job deflecting my fingerprints, too. Flush with its lid is an embossed Lenovo logo. On our review unit, the logo's adhesive began to peel, causing it to stick out a bit. Hopefully, this is not a widespread issue. But for a machine with otherwise great build quality, it was a disappointing flaw nonetheless. Lifting the lid is a breeze. It can easily be done with one finger while the laptop itself rests on a desk or on your lap. The top edge of the lid has a small lip that jets out, spanning its entire width. It hangs over ever so slightly, just enough for you to confidently lift. The wide lip is functional on a stylistic level, but lifting from anywhere but the center of the lid will cause the whole unit to lift. Opening the laptop reveals a brushed metal palm rest. A little different than the rubber-glazed palm rest found in the Y50, it's definitely not a step down. If anything, the material is a subtle addition that might win a lot of people over on this machine. Not limited to its function as a palm rest, the keyboard deck earns big style points as a uniform sheet of metal that hugs each key of the amazing AccuType keyboard and it's bold, red-wrapped keys. The metal ends just shy of the hinge in the back, giving way to two tiny, yet mighty speakers. The good looks really shine through if you choose to remove the factory-applied stickers. There are four, so have some Goo-Gone handy. Embedded in the lid's underside is a 1080p screen attached to a rigid plastic hinge. It's secure and doesn't wobble too much when you pick the laptop up or set it down. A thin strip of rubber lines the inside of the lid, preventing any plastic on metal clashing. The screen is surrounded by a thick, glossy bezel that houses a 720p webcam and light sensor that dynamically adjusts the brightness of the screen based on the amount of ambient light in your environment. These aren't cutting-edge additions, but add to the impressive list of cool features in this machine. In our sun-soaked New York office, the screen's matte gloss significantly limited the amount of glare. It is glaring, however, that the viewing angles aren't too hot at all. The vivid colors of the Windows 8.1 lock screen, which look pretty well-represented and stunning, immediately lose their luster if you attempt to view the screen from any other angle than head-on. A 1920 x 1080 resolution is a deluxe feature for a machine that starts under a grand. That said, there's more to every screen than just a resolution and for the Lenovo Y40, it's not all great. While the matte screen helps prevent glare, it hurts with subpar color accuracy. The screen just isn't all that bright. It may not concern some, but with the brightness turned up fully, the whites shine while most colors appear dull and washed out. Adjusting the brightness down even one notch makes things difficult to read and similar to what our reviewer thought of the Y50, I found myself cranking up the brightness in a pitch-black room. The AccuType keyboard is the laptop's greatest feature. As someone who frequently switches between Mac and Windows, the tactile, spaced-out keys helped to prevent too many unintentional key presses. Now, if only the trackpad were as graceful. Slightly off-centered underneath the keyboard, the trackpad struggled at times to correctly register my touch. It's sensitivity to touch, sometimes overly sensitive and other times, less so, is fidgety at best. For a gesture-enriched Windows 8 experience, this is especially problematic.